The nunnery of Roussanou (16th cent.) 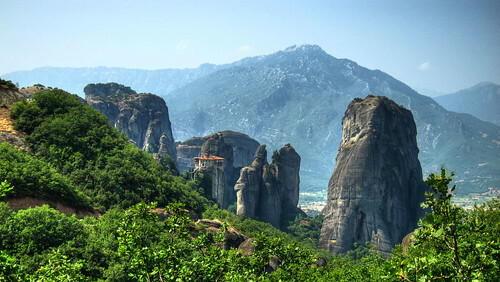 in Meteora. Dedicated to St. Barbara, it was one of the hermitages built by Orthodox Christians to avoid the ransacking of Turkish soldiers, attracted by the riches of the monasteries and churches. It was only in the 20th century that a stair was built to make access easy to visitors: for most of its history, nuns used ropes and pulleys to reach the holy place.